I changed a recipe from p. 148 of the December “Cooking Light” magazine to make it gluten-free and more economical. It came out great! We enjoyed these cheesecakes on Christmas Eve and also at a family birthday party on New Year’s Day. Because I bought a tiny little carton of raspberries in the winter, the cost was much higher than it would be in the summer when I have berries growing. That being said, I did cut the cost by making the sauce from frozen berries instead of buying 5 cups of berries as suggested. They were from my garden at the old house. I’m not even sure how many of those $3 cartons I would have had to buy to get 5 cups!! I plan to grow a mint bush, as I did at my old house, to garnish these in the future. I bought 1 package of foil cupcake liners from JoAnn’s. There were 24 in the package and I used 1/2 each time. Apparently there is a special pan with removable bottoms, but I don’t have one, so I took the 2nd option and used a muffin tin with those liners. I removed the liners when I served the cheesecakes. This recipe was more time-consuming than I normally make, and had a very festive feeling for the holidays. I think I will make it many more times, especially during the summer when I can grow my own berries. I also plan to try it with other toppings. Mix the dry ingredients in a bowl. Add the butter, canola oil and vanilla and mix. I stirred it with a wooden spoon, smashing the butter against the sides of the bowl until it was mixed into the flour mixture and looked like course sand. I did have a few lumps of butter that were a little larger than grains of sand, but it still worked. Then, I took my tablespoon measuring spoon and divided the mixture between the 12 muffin tins lined with the foil liners. I then pressed the mixture down into the bottom of the liners with the back of the spoon. Bake at 325 degrees for 10-12 minutes, or until lightly brown. Cool 10-20 minutes. Mix up all the ingredients, until smooth. They recommend a mixer, which would work very well, but I used a wire whisk and a spoon. The cream cheese needs to be extremely soft for that to work, though. Spoon into the liners on top of the crusts. I used my gravy ladle and it worked great. Bake at 325 degrees for 20 minutes or until just set an slightly puffed. Cool, then refrigerate until ready to serve. Mix the juice and sugar in a saucepan and bring to a boil, stirring to dissolve the sugar. Keep at a low boil for 2-3 minutes. Mix the cornstarch with 1 Tablespoon water and stir into the hot mixture. Cook about 1 more minute until mixture thickens. Remove from heat. Cool completely. 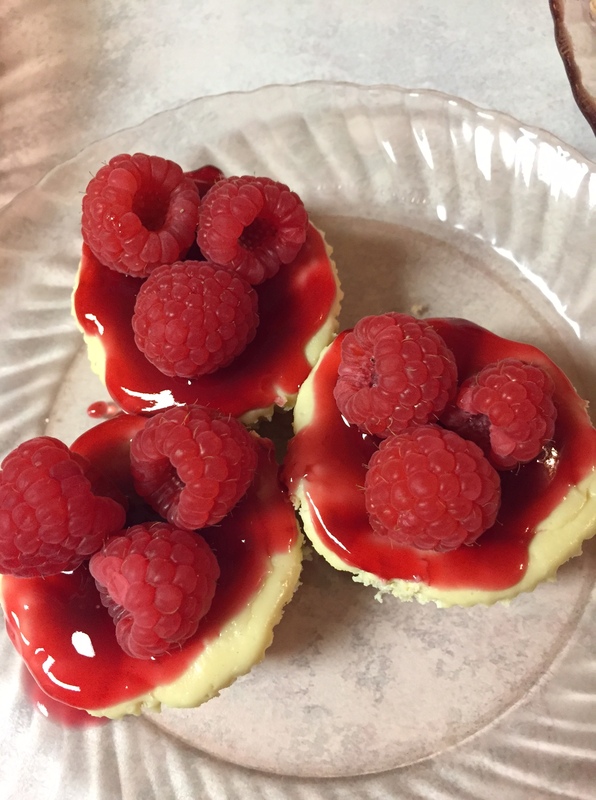 When ready to serve, spoon sauce over the cheesecakes and decorate each mini-cheesecake with 3 raspberries and a sprig of mint. I stored the cheesecakes and topping separately in the fridge and put them together right before serving. When our family could not eat 12 in one night, I only assembled the ones we needed and made up the others as wanted over the next few days. I think they would be good with blueberry compote over the top, and can think of several other good combinations I want to try. Thankfully, we have lots of family parties, so I know I will have many opportunities to experiment! Please pray for my husband, Bill. He had a major heart attack on Dec 27 and was in a coma until 2 days ago..He is doing much better but we almost lost our sweet Daddy. I had no idea how many friends we had but we have been loved on and cared for daily. I’m so sorry. I will pray for him and you, too. I’m sorry you had to go through that, but it sounds like he is going to be ok, which must be such a relief to you. Hang in there. Praying for Bill! Thank you for the amazing cheesecake recipe. I can’t wait to try it. :) I hope you feel better soon.